A good friend -- also a pasta lover -- recently lost a good bit of weight and turned me on to a great way to get that satisfaction of saucy dish of pasta without all the post-meal carb guilt. She insisted that it wasn't so much the pasta I craved, but more the sauce. Her secret weapon? Zoodles! Gluten-lover, I am, didn't go for it at first. So, I decided to try a side by side with one of the most satisfying pasta dishes of all time, Pasta Carbonara. Pork, eggs and cheese. That trio can make tofu taste good! 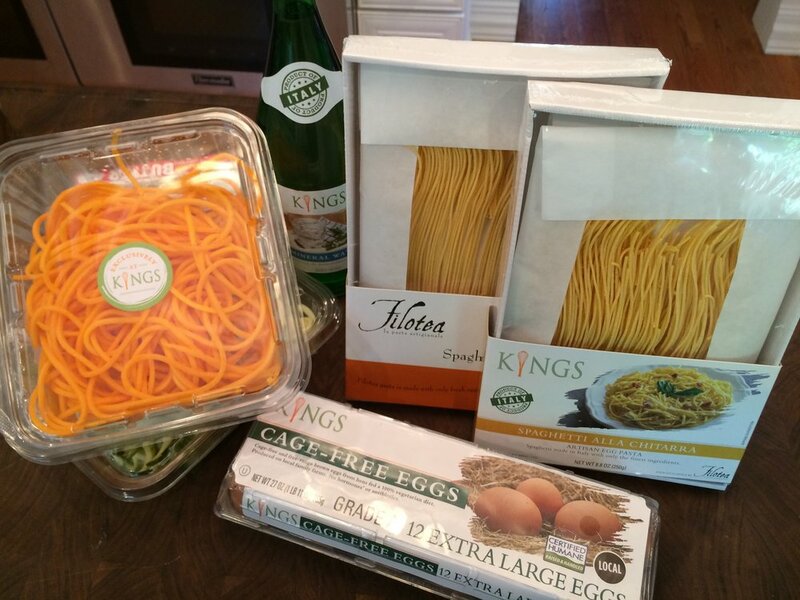 This time, I prepared it two ways: one with Kings Brand Artisan Pasta (Filotea, La Pasta Artigianale) Spaghetti alla Chitarra and the other with Kings Upper Montclair spiralized butternut squash noodles. So, how'd it go? The veggie noodles made a valiant and colorful showing, but, ultimately, I'll always opt for the pasta. The Artisan Spaghetti alla Chitarra.was exceptional. The color rich, it cooked up al dente with that nice "to the teeth" consistency. This may well become my pantry pasta. Arguably, a great carbonara is only as good as the eggs you use. Poached, and placed in a nest atop the pasta or veggie noodles, the Kings cage-free extra-large eggs provided a creamy, mouth-coating satisfaction, and exhibited a deep golden yolk. As I mentioned above, the veggie noodle version lacks a certain...indulgence. But that's the point, I suppose. Can I get used to it? Probably. If you opt for the zoodle variation, simply give a quick steam to the zoodles when poaching the egg. Be mindful of how long you steam the veggie noodles. They can get limp very quickly. I've been using the recipe below for years. It calls for slab bacon, but I prefer to substitute thick-cut pancetta and use only flatleaf parsley. For an extra peppery kick, try baby arugula. So, pour some Kings Sparkling Mineral Water, and give it a try!